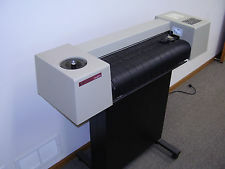 I bought a Hewlett-Packard Model 7570A DraftPro 8 Pen Plotter in 1988, for over $5000.00!, and used it to create architectural drawings, with AutoCad. Over time I moved on, the plotter got stored away, used occasionally for random plots but as software and hardware developed, the plotter did not, and in the end, I decided to either junk it, or sell it! I got lucky, Paul Meillon bought it for $75, and he paid the $60 to ship it from Calgary to Montreal. The plotter left my home to Paul’s, and he is producing new work, new art. I am amazed at what Paul is getting from a machine designed to draw lines on paper and more amazing perhaps, it only took people in four countries to get it done, our global community indeed! “My name is Paul Meillon, I am an artist, scientist and inventor from Montreal. I am fascinated by pointillism, how the brain blends points from a distance to create an infinite variety of colors and even textures. One problem with this technique is the amount of time it takes to make a painting, which can take up to a year! So I started brainstorming mechanical techniques to do the same thing. Some hackers and artists from Columbia University were using old plotters (pen-based printers) from the 1980s to create all sorts of art projects, including plotters that respond to music. Using their software libraries as a starting point, I hired some programmers in Hungary, Cambodia and the USA to develop code to make the plotter work, and be able to parse an image into dots, called stippling.